Now many applications are only available in the cloud or you have to be constantly connected to the Internet in order to use the software. However, it does not always bring benefits. This is different with the Fotoworks XL program. 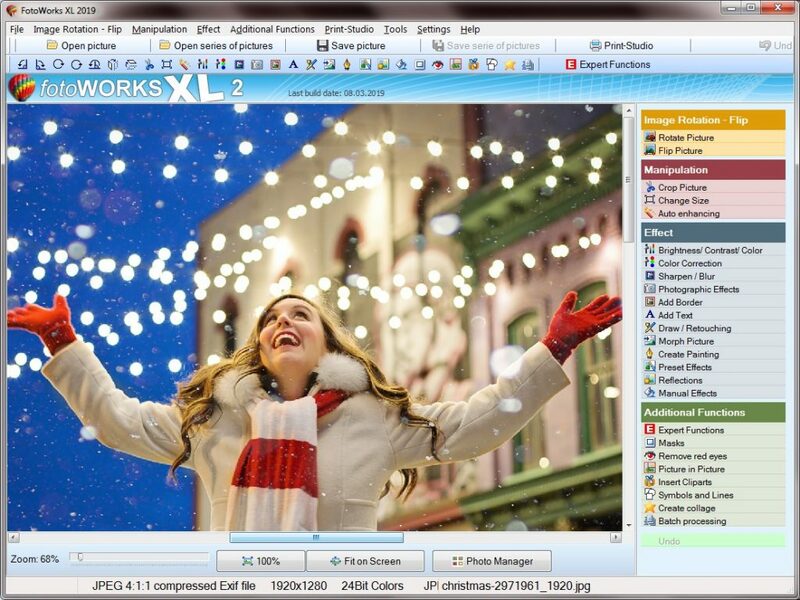 Fotoworks XL is a photo editing software that can be used offline. Also software to print a photo is independent of the Internet and online services if someone installs the program on the hard disk. The installation takes only a few minutes. Right after that you can edit your pictures right away. But photo editing is only a small part – the application can do even more. For example, Fotoworks XL lets you create collages from pictures. This is very easy on your own PC. The program is already one of the top 3 photo editing software. In addition, there is a variety of different effects that you can use directly from the photo editing software. But not only effects can be used quickly and easily also filters for graphics and photos can be easily applied. Everything you need to edit pictures is the photo editing software and a little creativity. In addition to the standard graphics program functions, such as rotate picture, mirror picture or change picture section you can also adjust colors or change the contrast. In addition, you can filter out or enhance individual colors in the picture. More here http://www.fotoworks.org/photo-editing-software/ The variety of applications is remarkable in the photo editing software for PC. Especially that you cannot only rotate pictures, but also apply effects to the entire drawing area. For example, you can create great photo collages with the photo editing software but even when it comes to improving photos, Fotoworks XL is the right choice. The Windows photo editing software is a true all-rounder. With the Windows photo editing software you have many options. Depending on your wishes, you can edit pictures in different ways. For example, would you like to cut out areas of a picture or maybe you want to add text and objects to a picture? In addition, you can also prepare images for a website. Or you can use the numerous text effects to create tension in this way. Cutting layers in the photo editing software? Of course you can also cut out layers with the photo editing software. For example after cutting out an area, you can paste it into another document. You can also cut and paste text and graphics and then edit them. This is especially interesting for photo collages. Inserting layers in the photo editing software: after cutting out a layer, you can paste it elsewhere. Layers can be inserted not only in new files, but also in the same document. In this way you can for example create great photo collages. Even text effects can be easily integrated into an existing composition. After inserting font, you can position it accordingly. Information about the photo editing software http://www.fotoworks.org/ In addition, you can rotate and move pictures in the photo editing software. With a little taste you can finally find the optimal position. You can also create impressive collages from your best pictures. For this you can simply select the appropriate motives. In the next step you can import the images via the import function in the photo editing software. Incidentally, in the program you cannot only work with effects, but also apply filters. So you can try to make certain areas of the image out of focus. In this way you can create completely new perspectives. The photo editing software offers many options for photo editing. You cannot only merge pictures but also split them here. Of course, it always depends on the particular project. For example, would you like to create a photo collage on the PC or do you want to alienate a picture or change the color? For each of these purposes, the photo editing software provides the appropriate tools. The best of all is that photo editing software on your own PC is so easy. Photo editing works very well with Fotoworks XL. That’s why you can recommend this program to anyone who wants to edit pictures on PC. Also the different effects and filters are emphasized here. For example, you can deform picture with the morphing effect or you can work classically with picture-in-picture techniques. Do you want photo editing software for yourself? – Anyone can now do that on their own PC at home. So you do not have to pay a lot for a graphic designer anymore. Even costly graphics tools can save you now, because Fotoworks XL has everything on board, what you need for good photo editing. The photo editing software is installed quickly and then it can start working. Even beginners can achieve great results with the program and that within a short time. A editing photo software can be easy to use or editing photo software for Windows PCs with a good rating? – Finally, these descriptions apply to Fotoworks XL. Because this program for photo editing is not only easy to use but is also really fun. For example, you can use the program on the PC to create true works of art. How about photo collage of the best of your pictures? With the photo editing software, you can easily create such a collage and within a few minutes. You want to refine a picture with your own computer? For example, you want to smooth skin wrinkles on the face or maybe retouch a pimple? Again, this can be done with the ease of editing in Fotoworks XL. You do not have to buy expensive software for such purposes. Here is simply enough a good pixel editor. The special thing about Fotoworks XL is that the pics editor combines good operation with cool effects. Not only classic functions such as cut picture or rotate picture is here in the toolbar. Also special color filters or distortion effects can be applied to photos and work with Fotoworks XL like professionals.